Clearwater British Columbia is a vacation paradise, with the majestic mountains of the world famous Wells Gray Provincial Park serving as a picturesque backdrop. The town is located where the Clearwater River empties into the North Thompson River, about 120 km north of Kamloops. The remote wilderness, the virgin forest, and the rivers, lakes and streams all combine to make Clearwater all that it claims to be. Wells Gray Provincial Park and Helmcken Falls is one of the main reasons many visitors come to Clearwater. and Helmcken Falls is not the only waterfall in the park. Spring time will be an especially fine time to visit with the falls at full capacity. This is real British Columbia wilderness with endless opportunities for outdoor adventure such as hiking, trail rides, paragliding, canoeing, climbing, swimming, and river rafting. Air tours are another great way to see the park from a whole new perspective. 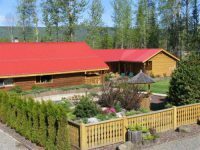 Your Clearwater Bed and Breakfast innkeeper can also tell you that Clearwater has three centres; the old village beside the Thompson River, the new townsite on the far side of the Clearwater Bridge, and beside the highway are a few hotels, restaurants, gas stations, services and the Visitor Info Centre. 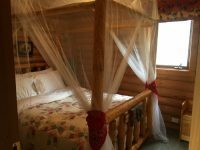 Enjoy the natural beauty of Wells Gray Park in our comfortable B&B setting in Clearwater and stay in a queen or king B&B room with en suite facilities. Sit back and relax on our sundeck or covered deck with view of the foothills of Table Mountain. Stay & Escape!